What is the best way to display many fields on a page? View form will display the data only - it will not be editable. There will only be a field description followed by the data - no rectangles around the data. Fields are grouped by category - Loan Information, Property Description, etc. At the bottom of the page, I was planning to have an "edit" button that would show a set of tabs when pressed. Each tab would contain editable fields in a particular category. This is for a real estate broker. They want to keep track of things like loan amount, loan begin date, term, cap rate, etc. the goal of the app is to be the CRM tool that runs their business. Is this a good approach? I'd like to take your suggestions, and then post a mockup to get more feedback. After reading through all your comments, here is what I came up with. Please mostly ignore everything except the middle large rectangle. The rest of it is the template that I bought. I am still trying to decide what to do with the boxes that say "Files, "123 Main St" and the blank box to the right of that. I am not cool enough (yet) to make major changes to the template... Also note that I'm not sure how to get basalmiq to show things as bold, etc. In the actual version, there will be some sort of visual cue that shows that each category is a separate category. The idea for this first slide is that the left column would contain summary information about the property broken down by category (location, Financials, etc). Each section would have a more... and edit link (button???). Clicking more... would bring up the complete set of fields for that category and display them under the picture. this second slide is what would come up if the edit link was clicked. Here are couple of ideas, some of which you may have already. I would probably place Edit at the top since if it is at the bottom of the page and there are a lot of fields, it will be below the fold (users may not see it) and even if the users know it is there they will have to scroll. I think it is a good idea to display read only view with data if the main goal is just consuming information. Also you may want to see if having a single Edit for everything is better than for each section. If users edit a lot it might get annoying to click edit for each section. Field display for reading need not be the same as field display for modification. For example, when entering details for an address, you'd need a whole heap of fields to capture (potentially) Apartment, Floor, Building Name, Street number, Street Name, Suburb, City, County, State, Country and Postal Code. But, not all addresses need all those fields, so you can get away with displaying just what's used when someone is reading the page. You can go further with this - some combinations of fields may be collapsible into a paragraph of narrative, or at least a couple of lines. Not the answer you're looking for? Browse other questions tagged fields or ask your own question. Should we warn the user that data will lost immediately or during saving? Case-study for hiding the optional fields? How to display unfilled fields in a view mode? 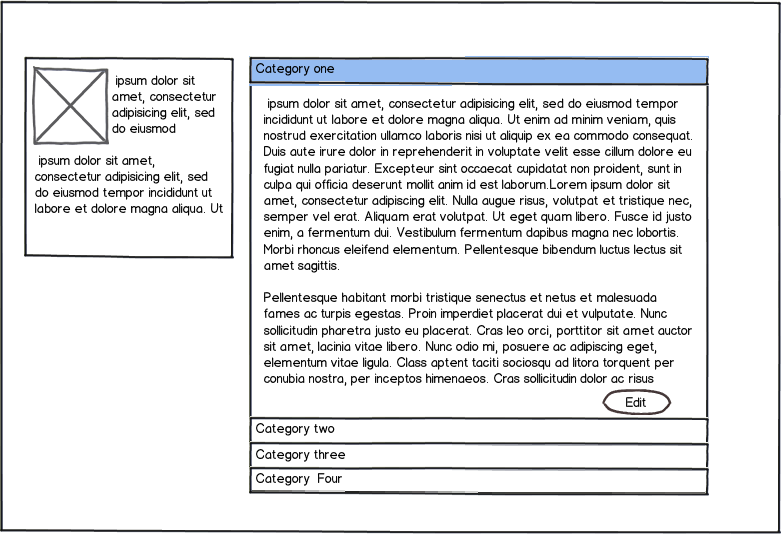 Best way to design a compact form intended for value calculations and entering lots of data? Twofactor fields, email code + authenticator code. One page or two pages for input?